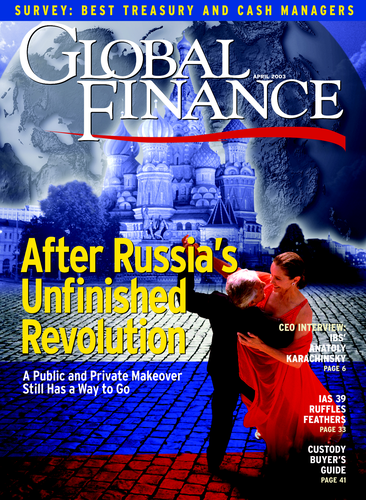 Global Finance selects the world’s best. The real-time global settlement process took a major leap forward in September 2002, when the CLS Bank went live, netting positions in a five-hour window in each 24-hour period. CLS, or continuous linked settlement, promises to reduce so-called Herstatt risk in the foreign exchange market when trades take place across various time zones. 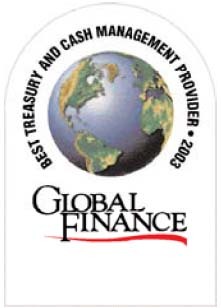 In today’s difficult global economic environment, risk reduction and cash-management efficiencies are critical to corporate success.With input from industry analysts, corporate executives and technology experts, Global Finance selected the best providers of treasury and cash-management services, globally and in 10 categories across four regions. “The Citi never sleeps”is an apt advertising slogan for Citigroup, the world’s first truly global financial institution, with 200 million customers in 100 countries. As the sun races across the world’s time zones, Citigroup’s legions of bankers are making sure that its customers’money circles the world just as quickly. The key to effective cash management is having your money where you need it when you need it. The CitiDirect online banking service offers seamless access to all of its business banking products via the Internet, just about anywhere in the world. In January the People’s Bank of China authorized Citigroup to offer Internet banking services in China to domestic and international companies and to consumers. Citigroup is the first foreign bank in China to offer these services to both groups simultaneously. The bank not only will offer its CitiDirect service for corporate cash management, but it also has developed an Internet-based system specifically for the Chinese retail market. The Citibank Easy Payments system will allow customers to make local currency payments to beneficiaries throughout the country from 7,000 locations. Elsewhere in Asia, Citigroup has expanded its payments networks in Indonesia and Thailand. Union Bank of Taiwan is the latest bank to sign up to Citigroup’s continuous linked settlement,or CLS service, to reduce settlement risks in foreign exchange. Citigroup’s worldwide pooling and concentration services are important liquidity-management tools for corporate treasurers and financial institutions. The bank has the people and systems in place to enable clients to make their money work harder and smarter. BEST OVERALL BANK FOR CASH MANAGEMENT: Regional Winners North America Bank of America Bank of America, the first coast-to-coast bank in the United States, with 4,200 domestic locations, gets high marks from corporate treasurers for understanding their needs and coming up with sensible and innovative solutions to their problems. Corporate treasurers praise Bank of America for its integrated systems, which help them to streamline operations and automate processes.They also commend the bank for its financial advice and unequaled execution of treasury strategies, as well as its risk-management capabilities. Six months ago, the bank’s Global Treasury Services division formed Aerarium, a forum on working capital. Its membership includes executives from large multinational companies and financial institutions who debate innovations and policy recommendations on working capital issues. Deutsche Bank Deutsche Bank’s stated goal, admittedly ambitious, is to become the best financial services provider in the world. Germany’s pre-eminent bank may not have the global reach of Citigroup, but corporate and institutional treasurers are in general agreement that it is the best cash-management bank in Europe. Deutsche Bank offers a comprehensive range of services to help treasurers improve their cash flow and streamline their processes, including payment and collection services, liquidity management, information and account services, and electronic bill presentment and payment solutions. The bank’s ‘db-direct internet’ service provides online tracking and monitoring of global cash positions. DB-direct offers such added-value services as global cash pooling reporting and indicative foreign exchange rates.Within two years of release, 8,000 corporations and institutions are using the service. Deutsche Bank’s ‘db-cinq’ application for its cashmanagement clients offers access to historical payment information in both US dollars and euros via the Internet.The service enables faster inquiry resolution and provides extensive online help. Banco do Brasil Banco do Brasil, the largest bank in Brazil and Latin America, operates an efficient collection and payments system. With 3,585 branches in Brazil and offices in 30 countries, the bank serves 1 million corporate clients, as well as 14 million retail customers. At a time when payments have become a standardized commodity, the bank offers a level of service and advice that gives it an edge in the region. Banco do Brasil’s earnings rose 87% in 2002 to $570 million, proving that it can operate profitably in a difficult environment. Aiming to be the most active regional bank in Latin America, Banco do Brasil has invested in the technology that enables it to move money quickly and effectively. The bank is focusing on serving more mid-size corporations, a market where it sees the best growth potential. Making use of credit-scoring systems, it provides working capital quickly via the Internet. HSBC HSBC provides global payments and cash-management services in 20 countries in the Asia-Pacific region. It is the largest clearinghouse and payments processor in Hong Kong and the leading provider of online banking services in Asia. HSBC’s proprietary electronic banking system, known as Hexagon, is available in 60 countries. Hexagon, designed specifically for corporations, was the first completely integrated global online banking product in the industry.The system makes use of HSBC’s Global Data Network,which the bank says is the largest private system of its kind in the world. Hexagon, with multi-bank balance and transaction capabilities, interfaces flexibly with other systems. HSBC has access to the majority of local clearing systems throughout Asia.The bank has sales personnel in every country and territory in which it operates, as well as a team of experts that implements regional cash-management solutions. JPMorgan Chase When it comes to liquidity, JPMorgan Chase knows what it’s all about.The bank processes as much as $1.9 trillion in wire payments daily. Last year JPMorgan Treasury Services rolled out a new nationwide lock-box network. Images of checks and documents can be retrieved electronically within two hours of deposit, thereby significantly expediting the posting of exception items, according to the bank. The lock-box network uses a patented Iliad online browser that enables clients to access remittance documents nationwide at any time. The system alerts customers when specific payments are received. It includes a seven-year image archive with disaster recovery backup. ABN-AMRO Amsterdam-based ABN-AMRO, one of the world’s largest banks,with a presence in 60 countries,offers global network banking services in liquidity management and payables and receivables. Its online international lock-box service makes it easy for corporations to collect checks in different currencies across multiple countries.The bank opens and maintains a local post box, which it empties daily, clearing the checks and posting the funds to the company’s account. Citigroup Citigroup serves 12,000 corporate clients across Latin America, where it has a presence in 24 countries. The bank helps clients streamline their business processes to manage working capital more effectively. Its Cash,Trade and Treasury Services division provides online payment and transaction services, vendor financing and other liquidity products. Argentina-based Techint, a global exporter of seamless steel tubes, selected Citigroup to implement cash-management services across 18 countries through the CitiDirect online banking platform. HSBC HSBC’s cash-management professionals offer a consistently high standard of service across the Asia- Pacific region. The bank provides the technology that enables corporate treasurers to automate routine payments and collections and to concentrate on managing cash positions effectively. Hexagon,the bank’s electronic banking system,provides swift and reliable account information at the treasury, head office, regional and subsidiary levels. North America JPMorgan Chase JPMorgan Chase’s Global Agency Treasury service allows companies with a number of overseas subsidiaries to create regional treasury operations without having to build them on their own.The bank handles all phases of activity based on specific instructions from the company or within agreed bounds. This frees up a company’s treasury group to concentrate on other pressing issues,such as funding and risk management.JPMorgan’s Insight treasury workstation integrates many automated treasury functions. ABN-AMRO ABN-AMRO’s global treasury outsourcing center, International Financial Services, has created an infrastructure that incorporates a corporate treasury workstation with the bank’s electronic banking products. The center serves clients in Belgium, Germany, Italy, the Netherlands and the UK, as well as the US and Canada. It is often more cost-effective for corporations to centralize and outsource treasury activities, the bank says. Other benefits include specialists using the latest systems with secure control procedures. Banco Itaú Banco Itaú, the largest private bank in Brazil,was the country’s first bank to offer an online international cash-management system. Itaú’s ‘office banking’ system automates many processes, making control of cross-border cash flows easier. The bank developed and deployed its online payments solution using Microsoft technologies and XML Web services. HSBC HSBC’s online cash-management system provides access to all of a company’s accounts, whether they are held with HSBC or another financial institution. Hexagon provides full statement information tailored to a client’s requirements.The treasurer enters transactions as they are created, and the system reconciles them against statement items. North America Goldman Sachs Goldman Sachs is one of the largest providers of institutional money market funds. The firm’s credit analysts provide an independently researched, approved list of securities to its money market portfolio management teams. Portfolios are structured based on the short-term yield curve, rate forecasts and expected daily asset volatility. SG SG’s funds receive top ratings for continued excellent quality in terms of security and risk control. Safety is a fundamental concern at SG Asset Management, one of the top fund managers worldwide. Paris-based SG purchased US asset manager TCW in 2001. JPMorgan Chase JPMorgan provides a wide range of short-term money market instruments and funds to help clients improve returns on short-term cash flows. Many of the funds are in excess of $1 billion in assets. The bank’s fund managers pool the assets of several investors to gain higher yields. Asia HSBC HSBC runs one of the largest money market portfolios in Asia, dealing in a broad range of currencies. In the Philippines, for example, it offers government securities funds granting investors the option to sell them prior to maturity at the prevailing market rate. HSBC’s funds offer competitive returns as well as a high level of safety. North America Bank of America Bank of America has awarded Texas-based EDS a 10- year, $4.5 billion outsourcing contract to design new platforms to provide new and improved services. With 4.7 million active users of its online banking system, the Charlotte,North Carolina-based institution works hard to keep on the leading edge of technological developments. The bank will participate in SunGard Treasury Systems’ eTreasury initiative, which offers corporate treasurers a single point of access to bank applications such as automated clearinghouse, wire initiation and information reporting. ABN-AMRO Royal Dutch/Shell uses ABN-AMRO’s pan-European cash-management network for its European oil products division, covering 18 countries. The bank provides a range of services for the division, including cash concentration, payments, collections and management of partner banks under a standardized, managed structure. Banco do Brasil Government-controlled Banco do Brasil operates fully integrated global payment systems. The new System of Brazilian Payments, or SPB, introduced last year will enable the country’s banks to offer true cash-management services, in addition to money transfers and collections. Banco do Brasil is investing heavily in technology. OCBC Bank Singapore-based OCBC’s Velocity service offers a suite of online cash-management services that speed business banking and improve risk management. The bank receives high marks for innovative service and customer satisfaction. It operates in 13 countries, with a focus on Singapore, Malaysia and China. North America SunGard Treasury Systems Calabasas, California-based SunGard Treasury Systems is a global provider of leading treasury management solutions. Broadly defined, the company’s systems increase operating efficiencies through treasury process integration. Its STS solutions link clients’ reporting systems with their banks and other treasury-service providers, enabling straightthrough processing of transactions. With 20 years of experience and annual revenue of $1 billion, SunGard Treasury Systems serves 10,000 customers in 50 countries. SimCorp Denmark-based SimCorp says one of the important things to consider when buying a treasury system is the service that comes with it. In a recent survey, 94% of its customers said they were happy with SimCorp’s service level, and most also said they get value for their money.The company’s latest system, IT/2 version 5.0, enables corporate treasurers to get a complete view of subsidiary operations and to combine their cash flows to obtain the best rates on money-market investments. SimCorp has subsidiaries throughout Scandinavia, as well as in Belgium,Germany, Switzerland, the UK, Hong Kong,Australia and the US. Banco Itaú Banco Itaú and other Brazilian banks have lived through high inflation and are keenly aware that time is money.Working with corporate treasurers, they have been forced to develop rapid payment systems. Banco Itaú provides Windows-based technology for its customers, as well as integrated services, such as online payment notification. Asia SunGard Treasury Systems Citigroup relies on SunGard Treasury System’s eTreasury eXchange, or eTX, to provide a range of treasury and cash-management services to customers around the world. Bank of America is working with SunGard to provide integration solutions for mutual clients. Using eTX, the trade and reporting systems of a company’s bank are integrated with corporate treasury management systems. SunGard serves 47 of the world’s 50 largest financial institutions. North America JPMorgan Chase JPMorgan Chase’s Horizon is a Web-based, enterprise- wide risk management solution. The service helps companies manage operating risks involving working capital, liquidity, cash management and other activities. Horizon provides an automated set of controls and procedures that can be monitored from a single location to give a clearer picture of risks. Fortis To make the most of surplus cash, companies may simply opt for the highest return, or they may use some of the cash to limit corporate risk. Brusselsbased Fortis says structured products and derivatives can be used to improve a company’s risk profile. With major insurance operations, Fortis knows something about having to deal with risks. Banco Bradesco Banco Bradesco is one of the largest financial services firms in Brazil and Latin America. The bank, known for its Internet banking services, is Brazil’s largest force in derivatives and operates the country’s biggest insurance company,Grupo Bradesco de Seguros. HSBC HSBC offers a range of specialized products to reduce a company’s risk exposure, including credit investigation, bill-status reporting and factoring.The bank’s online reporting systems and protection against check fraud help to manage risks. North America JPMorgan Chase JPMorgan Chase’s pooling services allow for notional offset of long and short balances for the purpose of computing interest. Since the services are notional, funds are not moved, and co-mingling is avoided. The bank’s sweeping services reduce overdrafts and lower local funding costs. ABN-AMRO ABN-AMRO’s cross-border zero balancing reduces debit interest and increases credit interest, improving a company’s ability to manage liquidity. The bank provides most of the administration. Citigroup offers notional pooling, whereby accounts in a single currency are concentrated for interest purposes. Net pool positions with excess funds are automatically invested. The bank has a presence in 24 countries in the region. Citigroup CitiDirect, Citigroup’s online banking service, offers seamless access to all of the bank’s business banking products. Citigroup operates a 13-country regional cash-processing center that handles about 18,000 cross-border funds transfers—$19 billion a day. North America JPMorgan Chase JPMorgan Chase offers customized services designed for specific payment types, as well as collection options ranging from paper-based to electronic and imaging technology.The bank offers integrated solutions to streamline payment and collections processes. Its PaySource service provides access to global payment capabilities. Deutsche Bank Deutsche Bank offers innovative solutions for a broad range of corporate and financial customers. Global cash management is a core business for the bank, and it offers a comprehensive range of payment services with an emphasis on technology leadership. Citigroup Citigroup’s payments and collections products enable Latin American companies to manage liquidity more effectively. It is a leading provider of integrated cash-management services to multinationals, financial institutions and governments. AsiaHSBC HSBC’s global payments and cash-management services are based on partnerships with its customers. The bank offers effective support and flexible interfaces with corporate systems. North America Bank of New York CLS, or continuous linked settlement, aims to reduce risk in the foreign exchange markets through an industry-wide service for settling crossborder payments.Bank of New York’s SafeSettle provides a proprietary online link to the CLS system in a highly secure environment. ABN-AMRO ABN-AMRO was awarded a major CLS third-party mandate by Bear Stearns after the bank demonstrated its ability to process large transaction volumes and offer comprehensive services on a global basis.ABNAMRO offers free testing facilities for third parties. Banco Bilbao Vizcaya Argentaria Banco Bilbao Vizcaya Argentaria, a leading bank in Latin America, is one of 70 CLS shareholders.Wall Street Systems implemented support functions. Asia DBS Singapore-based DBS, recognized for its online banking services, is a shareholder of CLS. The bank’s browser-based IDEAL system is easy to use to monitor foreign exchange movements and contracts.